Over the last 3-4 days our team spent nights at C1 and C2 and even tagged C3 before descending to base camp for a rest period. They enjoyed great views of K2 and life high on the steep mountain during this time and are quite well acclimatized to 6200m or better now. 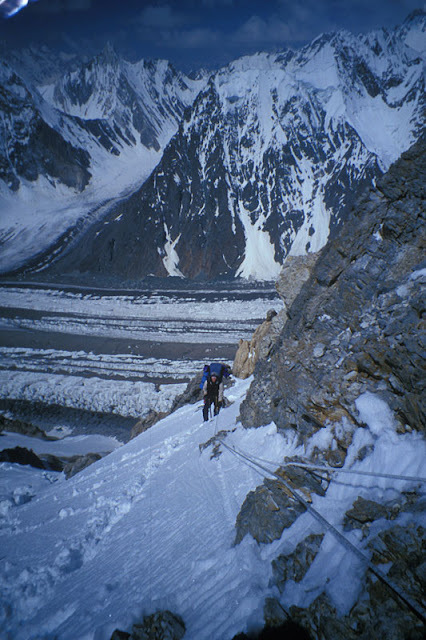 Unfortunately, on the descent below C1, Brian sustained a lowed leg injury and had to be assisted to return to base camp. A few climbers from other teams, local HAPs and a rescue group from Concordia all assisted and we thank them all for their great help. His injury is serious enough that he will need to have a flight out but he is uninjured aside from his leg injury. When he is back in Skardu we will be able to assess the full extent of the injury and sort out his best course for treatment and return home. We have arranged for a helicopter flight out and are awaiting good weather for the next chance for them to fly him out. At this time the whole team is safely resting at base camp under the cover of clouds and hoping for clearer skies tomorrow. After a few days at base camp the remaining members will look to make a final cycle to spend a night at C3 before looking for a summit bid. Having already had nights at C2 though it is possible for the team to make a bid on the next round up and the long term forecast looks like a low wind period perhaps around the 17th of july. We will have more updates on Brian's evacuation and the climbing plan in the next 24-48 hours and post it then.